Fleming’s Prime Steakhouse & Wine Bar (25 E. Ohio St., Chicago, IL 06011; 312-329-9463) will host a Silver Oak Wine Dinner with special guest, artist Thomas Arvid 6:30 p.m. February 10. 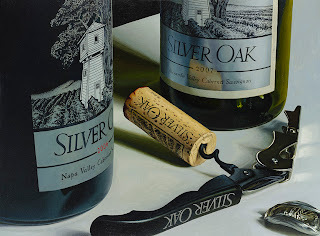 Arvid will unveil three new paintings at the dinner, which features wines from Silver Oak Vineyards. Tom Johnson, from Silver Oak also will be at the event to speak about the wines. All images ©2012 Thomas Arvid. All rights reserved. The meal will begin with Fleming’s Jumbo Shrimp Cocktail with Caramelized Lemon and Cocktail Sauce paired with Twomey Sauvignon Blanc, Napa Valley, 2010. This is followed by Poppyseed and Black Pepper Encrusted Ahi Tuna Skewers with Tomato Vinaigrette accompanied by Twomey Pinot Noir, Santa Barbara, 2008. The third course will be a delicious Fleming’s Salad with Candied Walnuts, Dried Cranberries, Tomatoes, Onions, Croutons and a Lemon Balsamic Vinaigrette. A Petite Filet au Poivre with Broccolini and Lemon Essence and Lobster Mashed Potatoes will follow. This is perfectly paired with Silver Oak Cabernet, Napa Valley, 2006. Dessert is a decadent Belgium Cheesecake with Raspberry Port Reduction and Chantilly Crème paired with Silver Oak Cabernet, Alexander Valley, 2007. The Silver Oak Wine Dinner with Thomas Arvid is $150 per person, excluding tax and gratuity, for five courses and four wine pairings. Reservations for the Silver Oak Wine Dinner with Thomas Arvid at Fleming’s are required and may be made by calling 312-329-9463. Fleming’s Prime Steakhouse & Wine Bar exclusively features Thomas Arvid’s work in all Fleming’s throughout the country. Fleming’s annual 46 Diamonds release label also features artwork by Thomas. He is releasing three new pieces at the Chicago event. All artwork will be available for sale at the event. A self-taught artist, Thomas Arvid is famous for his wine paintings, which tell the story of enjoying the good life. Arvid was inspired to paint wine because of his connection to the color red. When people started buying his paintings before they were completed, he knew he had tapped into something unique. He is known for saying, “Life without art is like dinner without wine. Why bother?” His paintings are featured in over 50 galleries and collected internationally because of the way they translate the craftsmanship of wine. Silver Oak has been producing high quality Cabernets for 40 years from their Napa Valley and Alexander Valley vineyards. Run by the Duncan family, Silver Oak strives to age their food-friendly Cabernets so they are drinkable upon release. The family is also involved with Twomey Cellars, founded in 1999, which specializes in Merlot, Pinot Noir and Cabernet Sauvignon. Twomey follows the same philosophy as Silver Oak and strives to have their wines drinkable upon release. For more information about Silver Oak, visit http://www.silveroak.com. Celebrate National Margarita Day at Guanajuato! Dodge, Duck, Dip, Dive and Dodge...for CHARITY? February is National Snack Month!